Agilent Technologies has announced nonlinear vector network analyser (NVNA) capability for its PNA-X microwave network analyser, establishing a new industry standard in RF nonlinear network analysis from 10MHz to 26.5GHz. Requiring minimal external hardware, the Agilent NVNA software effectively converts a 4-port PNA-X into a high-performance nonlinear analyser. Featuring nonlinear component characterisation, new nonlinear scattering parameters called X-parameters, and nonlinear pulse envelope domain capabilities, it is ideal for R&D engineers and scientists researching and designing active RF components. Tools specifically designed to make nonlinear measurements are required to accurately characterise the nonlinear behaviour of active devices, particularly high-power amplifiers and frequency doublers. By understanding and being able to control and minimise a device's nonlinear behaviour, engineers can create linear high-power solutions. Currently available tools and models for accomplishing this task can be difficult to use and often do not provide the required information. Agilent Technologies' new NVNA capability provides a fast and powerful approach to solving this challenge, enabling characterisation of a device's nonlinear behaviour with high level of accuracy, speed and ease-of-use in the industry. The NVNA capability is based on a standard PNA-X microwave network analyser and therefore provides all the power, flexibility and measurement capability of the PNA-X for linear measurements. It can then easily switch into the NVNA mode for nonlinear measurements. One of the NVNA's key capabilities is its ability to measure the calibrated amplitude and cross-frequency relative phase of measured spectra from 10MHz to 26.5GHz. Component characterisation is enabled by measuring and displaying both the amplitude and phase of the full spectra -- fundamental, harmonics and cross-frequency products -- in the familiar and powerful PNA-X network analyser. As a result, engineers are now able to better understand and more deterministically control the nonlinear behaviour of their device under test (DUT). Data can be displayed in time, frequency, power or user-defined custom domains, providing additional insight into the nonlinear behaviour of their components. Another key feature of the new NVNA capability is its ability to provide nonlinear scattering parameters called X-parameters. Such functionality extends linear scattering parameters into the nonlinear operating region and enables an accurate portrayal of both nonlinear device and cascaded nonlinear device behaviour using measurement-based data. The X-parameters can be used in Agilent Technologies’ Advanced Design System to accurately simulate and design using nonlinear components, module and systems. The result is higher level of insight into nonlinear DUT behaviour, making the NVNA capability especially useful for scientists researching new RF technologies and engineers involved in designing today's high-performance active devices. The NVNA also provides a nonlinear pulse-envelope domain measurement, which enables researchers to gain a deeper understanding of the memory effects exhibited by their devices by displaying the harmonic pulse envelopes. Both the amplitude and phase of the pulse can be displayed in the time domain, which shows the changes over time. 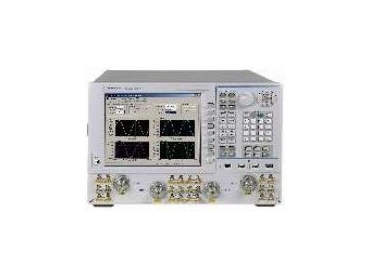 Agilent Technologies’ new nonlinear vector network analyser options for the Agilent N5242A PNA-X microwave network analyser are available now.